Lisa Adams, Toffee's House, 2016, oil on canvas, 16" x 20." Image © of the artist and CB1 Gallery. A drought has plagued Southern California for nearly a decade. Lisa Adams possesses an intuitive and effortless connection to her surroundings whether it’s her daily walks through the asphalt jungle of Downtown Los Angeles, visits to the LA River, or exploratory hikes in the mountains. In recent weeks, Los Angeles has experienced an unusual and much-needed shift in the diurnal dry 72 degrees and sunny weather- rain. 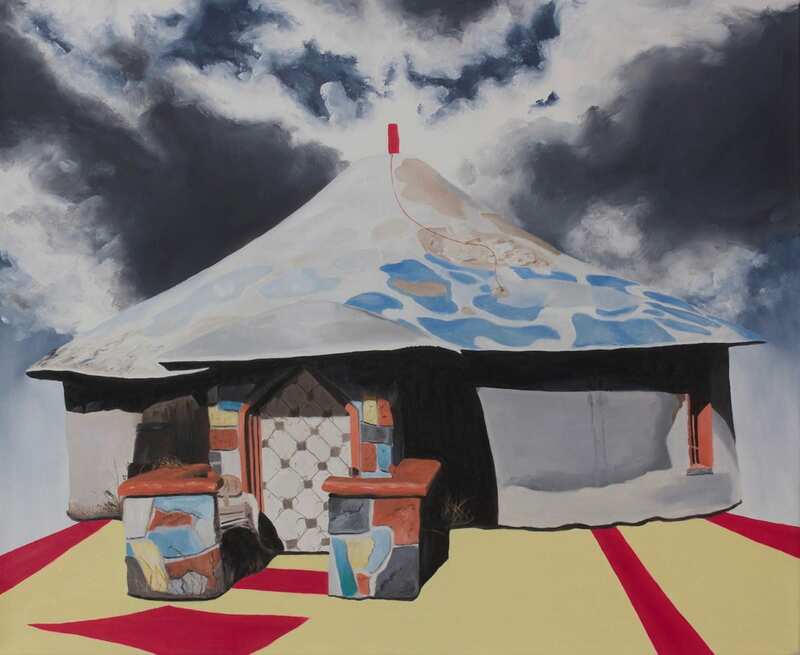 It only seems appropriate that the artist would begin working on her latest series of paintings during the sixth year of the drought and completed the works after the first rain drops began to fall in the winter. On the eve of her solo exhibition “Petrichor,” Adams prepares to present her first solo exhibition of only small oil paintings in the past fifteen years. Petrichor originally came to me from “A Word a Day” via my partner Jayme Odgers, who subscribes to wordsmith.org. I’d never heard the word before but it was so descriptive of something that is unique in the human experience. “Petrichor” is defined as “a pleasant smell that frequently accompanies the first rain after a long period of warm, dry weather.” Because of our six-year drought here in Southern California, the sensation of petrichor was more vivid than ever once it actually began to rain. It occurred to me that I’d started the twelve paintings for this exhibition in the driest, dustiest time I can recall and completed them while watching it rain outside my window. In many ways, the paintings feel like a bridge from one era to another. Since we first met in 2008, you have painted in various scales that range from ambitious large-scale paintings to small gouaches. What influenced your decision work on a smaller scale after so many years? Deciding to do this group of small-scale work grew out of a desire for intimacy and is a big contrast from my last exhibition, which included some of the largest paintings I’ve ever made. A group of small paintings can be very powerful if they are thoughtfully installed in the right kind of space. 15 years ago I had a show of small works at an equally small artist-run space that ended up being reviewed by Art in America. I think I just have more to say and learned how to pack a lot of information into a smaller space. As I’ve continued to work, decade after decade, ideas, images, and methodologies seem accumulative. The “landscape” has become vaster and more populated in a way. 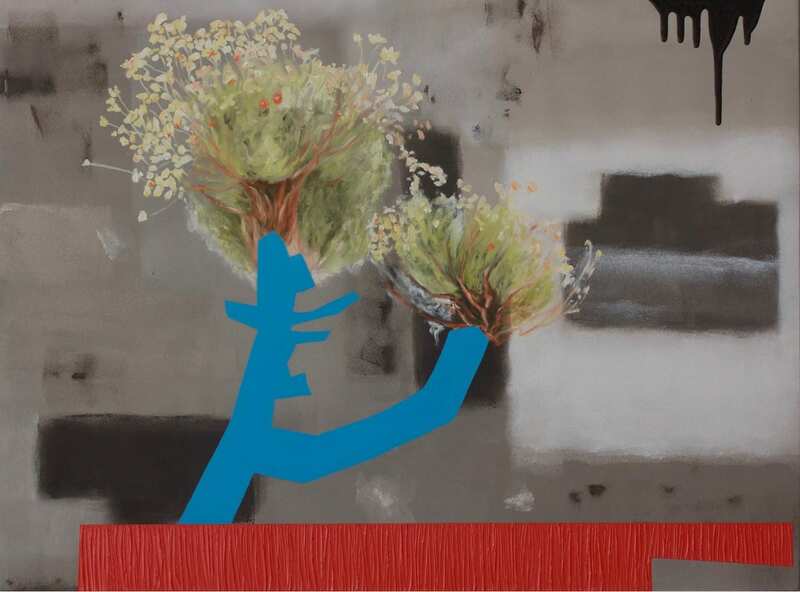 The paintings at CB1 Gallery are very closely related in planning and methodologies to my larger work. Because they are far more complex than the work of fifteen years ago, they appear like “little gems.” When I saw them installed in the space it felt as if you were looking at the room through the wrong end of binoculars. The paintings feel compressed because of the combination of scale and complexity and in some way they read like much larger paintings. Has the smaller scale inspired a distinction in focus or subject matter? I would say this show diverges from my previous work a bit in that it includes some aspects of the human form, though Borderland, a 12 ft. painting from my last exhibition, did include the human form as well. Lisa Adams, Spontaneous Generation, 2016, oil on canvas, 18″ x 24.” Image © of the artist and CB1 Gallery. What challenges or creative freedoms does working on smaller canvases allow? One notable thing about working at a smaller scale is that it doesn’t involve as much of one’s physical body, not in the making or in the moving around of the work. In that way, it is very easy to maneuver. On the other hand, there is a tremendous demand in terms of focus; the nuances feel endless and decisions are truly micro-decisions. Does a smaller surface area allow for more exploration in technique? Manipulating paint at a small scale is quite specific and it’s harder to rely on the notion of materiality; for example, there is only one painting where I included paint butter and used a tiny roller. It’s clear to me that I painted them differently because of their scale though the tropes are similar. Lisa Adams, Dun Hemet, 2016, oil on canvas, 18″ x 22.” Image © of the artist and CB1 Gallery. What are you looking forward to in the next 15 years? Do you have ambitions to paint on a large scale again? Or does the smaller canvas allow for a newfound freedom? I think I will always paint between large- and small-scale work. I prefer to switch things up depending on how I feel in my body and what urges I need to satisfy Sometimes I love being quiet and focused and other times I really enjoy and need to paint with all of my body. One thing I do know is that I miss painting when I don’t do it on a consistent basis. Sometimes I think about including animals in my painting and those paintings would have to be fairly large paintings. I’m intent on inventing a complex and imaginary world for myself and others to experience. Discover our previous articles that trace the career of Lisa Adams. “Petrichor” will be on view at CB1 Gallery from February 25- April 9, 2017. A reception for the artist will be held on Saturday, February 25 from 4:00 – 7:00pm. Artists: Lisa Adams  Archived in Art, Contemporary, Creative and tagged California, canvas, CB1 Gallery, Drought, Interview, Lisa Adams, Oil, Painting, Petrichor, Preview, Solo Exhibition. Bookmark the permalink.